Could the Swords be from Spain? "One (possible) interesting point I discovered (as I spent a few minutes googling 'hercules and two lions' (assuming those are lions), is that the Andalusian Coat of Arms depicts Hercules with two lions. Seville (Andalusia Spain) has a rather famous statue of Hercules and two lions (Hercules is the mythical founder of [Seville]). It may very well point to an origin of the original sword (used for all these reproductions) in Spain (Seville/Andalusian region specifically) versus Naples/Italy." This was news to me, and potentially significant. I know that a lot of people (myself included) having been dredging through whatever information we can find online to try to identify an "original" Roman sword from or in the Naples/Pompeii region of Italy, with no success. Maybe we've been digging in the wrong spot. Could the swords be Spanish rather than Italian? 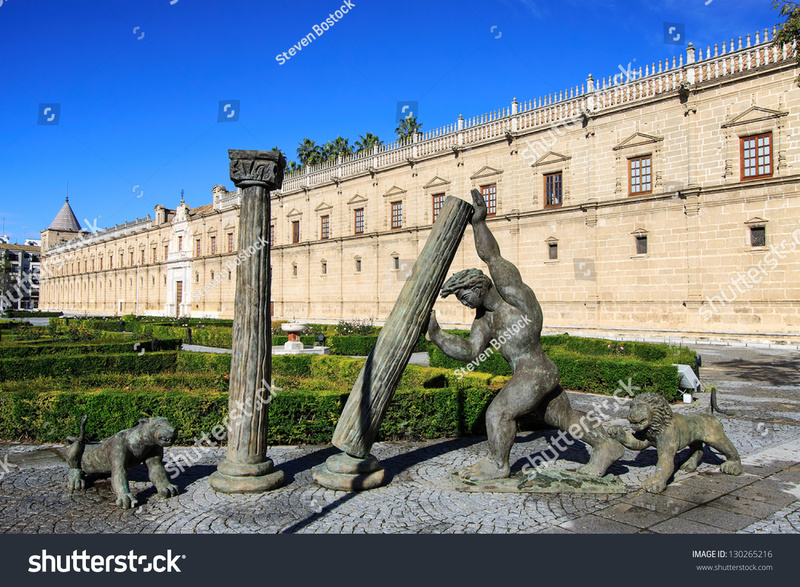 The first image shown below is a statue in Seville, Spain (image source). The second is a statue in Rondo, Spain (image source). 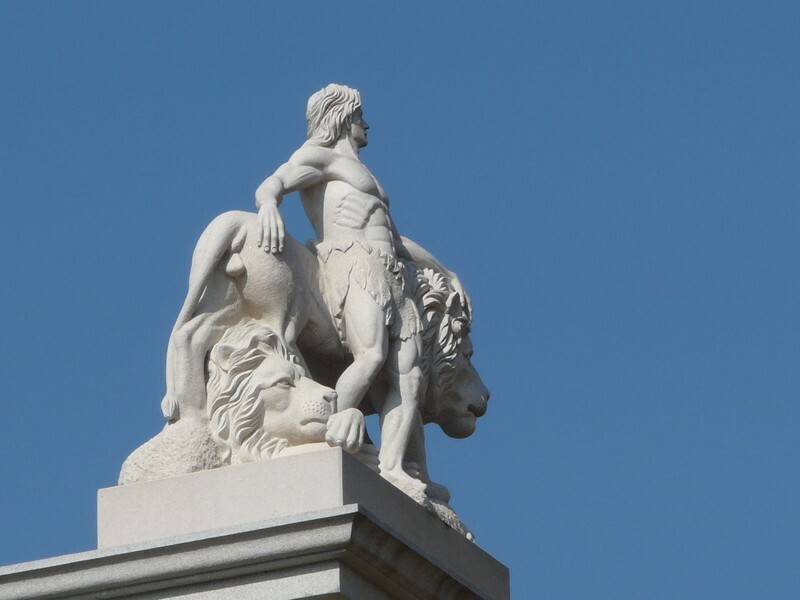 Here's another statue in Seville of Hercules with two lions. Hercules with two lions, Seville, Spain. Hercules with two lions, Rondo, Spain. Thanks Peter - those are some great images. Do you think it's time for another comparative composite now that there are two more? Sure, I can get to it tonight. Man, its hard keeping up! I know - no rest for the truth squad. And the pay stinks. A spanish sword would continue the columbus theme from the show last week--- if the sword is 500 years old. Wait, so Columbus was a Roman? This is awesome! Stop denying the truth Andy. I'm curious, what "truth" is he denying? Because the "roman" sword is not truth until evidence is shown and there's no white paper in sight. Stand down, Pablo. Dan's a friend of mine. He's just giving me a hard time, 'cause that's how he rolls. oops, sorry; sometimes I make comments right after a cup of coffee. At this point, I'm going to look under my couch cushions- there's bound to be one of them in there too. Crap - I didn't realize the couch cushion line had already been used. I'm changing today's post. Thanks for the Tuck information on the sword. I stopped watching the show because of the huge pile of horse manure piling up between the money pit and 10X. It's worse than boring, it's beginning to smell like an incredible (in any way you want to use the word) hoax. The last straw was the glimpse they gave of "the sword' near the end of last season.I was a Classics major in college. 'nuff said? But, Rose, you just didn't recognize it as a Roman sword because it's such a fantastic, unique artifact. Oh wait - they're all over the place? Well that's because this sword is so famous that they've been making copies and handing them out like party favors. Horrors! How could I have missed such a magnificent specimen? I'm almost tempted to order one. Think JHP has a few extras? I was so excited about the sword stuff I almost forgot,,, while I was rummaging through my junk drawer I found a unicorn that farts rainbows. It's out in the backyard.. Do you think I could get the Laginas interested in it? Monaco and surrounding coastal areas have a strong identification with the lore of Hercules as well. The Torre de Hercules lighthouse is thought to be Roman in origin and was a Prime Meridian. It is in A Coruna Spain in Galicia.